A new Don Quijote (DonKi) location recently opened down the street from my apartment. Unlike all of the other teachers who live close to the station, I am fortunate enough to live across the street from 7-11, and less than a 5 minute walk from both Seiyu and DonKi. I love my apartment! After work, Super Dave, Azeroth, and I met up and went to DonKi to load up on snack food. After a solid hour of wandering around, we left with booze, pretzels, salsa (hooray), spam, and other goodies. I’m not sure whose idea the spam and cheese sandwiches were, but it wasn’t the best idea. Other than that, we had an enjoyable evening of snacking, drinking, and watching Fawlty Towers. The show is still funny 30 years later, and I’m sure people will still enjoy it for many years to come. If you are visiting Japan, you must visit a DonKi location. It’s a necessary part of the Japan experience. Today I spent time once again trying to organize my room at Ooka City Plaza. 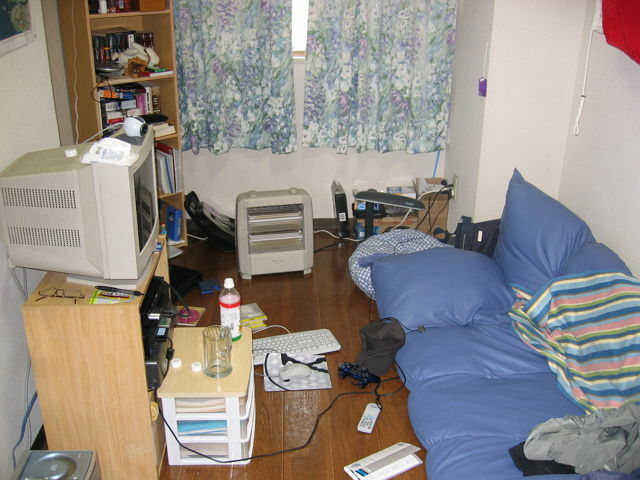 My room is the smallest of the three bedrooms, and has an awkward shape. That combined with the sheer volume of stuff I am trying to keep in there makes it difficult to get the way I want it. Today my closet got attention. The closet is large enough that I had at one point considered setting up my futon inside and turning it into a private sleeping area. However, recently it has become a storage area for empty boxes. I cut down the boxes I didn’t need, and organized the rest to make the rest of the closet more usable. My next project is to organize, sort, and throw away some of the random stuff that is currently stashed in my giant suitcases. It is surprising how much stuff a person can collect in a year and a half. Progress on my room is always very slow. At this pace I will probably just finish finding the ideal setup right before I move back to Canada. Today was moving day! I am writing this from my new home in Numazu, Japan. The mover arrived around 9:00am. He was a huge, muscular guy with terrible skin that couldn’t speak any English. We managed to decide where to park the truck, and then started loading all of my stuff. He was easily carrying my heavy boxes of books while I struggled and tried not to fall down the stairs. I got my room inspected, said my final goodbyes, and we set off for Numazu. This was my first time to travel to Shizuoka by road. It was a very different experience than Japan Rail. The mover and I were able to have a very basic conversation on the road, thanks to my limited Japanese ability and my Japanese / English dictionary. The highlight for me was the GPS Navigation system. I am a fan of all fun technology, so I was thoroughly entertained by the map updates and the recommendations of places to stop, gas up, or eat along the way. I also had a good laugh when the GPS started up and said “Let’s Practice Safety Driving”. The term “safety driving” is one of every English teacher’s biggest pet peeves, right up there with “go to shopping”. Japanese addresses are not terribly useful because of the lack of street names. We entered my new address in the GPS, but it got lost and directed us to a loading dock next to a factory of some sort. Thankfully, The Penpal and I had scouted my new apartment a few weeks ago, so I was able to give some basic directions and we eventually found it. The mover was impressed that I had a Japanese girlfriend. Go me! We eventually found the apartment and unloaded all of my junk. My new home is a three bedroom apartment in a building called Ooka City Plaza. I have two roommates – Azeroth and Palmer. Azeroth is an American who works at Fuji branch, and Palmer is a tall, bald Australian who works at Numazu branch. So far they seem pretty cool. In the evening The Penpal came over to check out my new place, and we went out for food together. So far I really like my new place! More details to follow. You are currently browsing the archives for the Ooka City Plaza category.